Picture yourself back in 2012. Now, picture yourself as a homeless person in Korea back in 2012 (bear with me, please). You’ve probably had an extremely hard, rough, difficult day. You’re walking down the street, and suddenly, you see two women with short brown hair and casual clothes, playing the Korean janggu drum and guitar, while scream shouting lyrics about the human primal fear of insects. These ladies just put on this idiosyncratic performance for you, and all the other homeless people in the city, as a completely spur-of-the-moment decision. That’s got to brighten up your spirits, even if its just a little and temporarily, right? These ladies go by the moniker, Mukimukimanmansu. If you’ve ever seen the anime Aggressive Restuko, you already have a sense of the band’s eccentric vibe. Much like how the titular red panda heroine of the series blows off steam from working by screaming lyrics about the banalities of a nine-to-five job, the female duo shout-sings about topics such as the everyday struggles of taxi drivers. Of course, there are differences in their musical inclinations; Retsuko croons heavy metal while Mukimukimanmansu performs an unconventional kind of punk, but that’s beside the point. I’ll admit, when I first saw the one minute and thirty seconds clip of a live performance of their song, “Andromeda”, I died laughing. It reminded me of this rock/metal song that my friend once downloaded for kicks off of iTunes called “Juliette”, of which consisted of a 30-second loop of the scream-sang phrase “I am Juliette”, by Juliette (who was an eight-year-old Australian girl) off of the album Juliette. And if you’ve ever had the opportunity to attend any of their live shows, you might have shared my initial reaction. The ladies have a very quirky stage presence, to say the least, rocking Birkenstocks and bare feet on a professional performance stage. One thing that becomes clear through the clip, however, is that no matter how kooky their stage presence, it is still exactly that — a stage presence, and a beguiling one. This becomes evident through the audience reactions: a man in a white shirt who is clearly a fan (or became a fan) not bothering to conceal his enthusiasm, some people looking in bewilderment, and others suppressing smiles while clapping throughout the performance. But this is exactly what they’re going for, and not in a parodical or satirical sense. The duo has described their music as a “supranational intelligent punk sound”, taking cues from late 70’s British punk. The raw, carnal, and free-spirited affectations of 70’s punk are captured through their lyric-making process. They have stated that their songs are composed as they let “stuff come out” and “screamed and shouted following [their] temper”. This uncareful approach to their lyrics invokes a sense of nihilism in their music, which draws another parallel from their style to that of punk musicians. A little background information about Mukimukimanmansu: their tongue-twisting name comes from a portmanteau of both of the members’ names: Muki (who plays the guitar) and Mansu (who plays the janggu drum). They formed in 2011 and were signed to prominent K-indie record label, Beatball. They released their first, and only, album 6 years ago, titled 2012, produced by Dalpalpan, formerly of indie rock groups H2O and PiPi Band. The duo has described their album as “a gift” for the year 2012, or a souvenir photo containing all their memories together, as they graduate from school. Their album has been described as polarizing, which is a pretty accurate assessment. A certain type of listener may be put off by the simplicity of the instrumentations, the discordant vocals, and some of the incoherent lyrics. However, it becomes clear through multiple listens that the album pieces together a large collage through snapshots captured by individual songs. Titles such as “Head Size (Big Head)”, “If I Confess My Love, You Will be Surprised”, and “Struggle and Diet” conjure images of the women’s insecurities and sentimentalities. This is contrasted by songs like “Andromeda” and “Namsan Tower”, of which offset the romanticism of the previous songs with glimpses into the mundane portions of their lives. 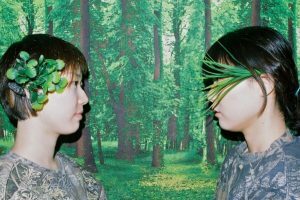 The ladies of Mukimukimanmansu sought out to create a souvenir of memories, and they accomplished that well by encapsulating all of their past moments and feelings into songs: the ups, the downs, and the in-betweens. By opening the album with “Andromeda”, Mukimanmansu puts their least melodic and most unromantic song first, which gives the listener the impression that the songs that follow will be similar. However, by “Namsan Tower”, the scream-singing that characterized the first few songs of the album largely recedes. As the songs get more emotional, so do the vocals. 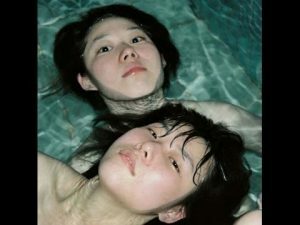 In the tracks located toward the end of the album, “Mukimukimanmansu” and “Struggle and Diet”, the screaming is largely replaced by raw, melodic vocals. This invokes a disarming type of effect, as we witness the band stripping away the initial shock of the screaming and gibberish-sounding lyrics about trivialities, slowly unveiling their true inner thoughts. Behind all the vocals are two instruments: the guitar and janggu drum. The austerity of the backing instrumentals injects all of the songs in the album with an underlying sense of emptiness. This, once again, recalls the nihilism characteristic of 70’s punk sounds. The overall effect is a quirky, compelling memoir of the lives of two women with a penchant for punk rock. Although Mukimukimanmansu disbanded in 2013, we still have the relic of 2012 to remember the duo by. 2012 may have been the prophesied year of the Mayan doomsday, the title of a movie about said doomsday, and the name of a Jay Sean song espousing an optimistic take on said doomsday as a metaphor for partying, but it was also the year that two college students made memories, and memorialized their time together into an album. While everyone else was worried about the apocalypse, they were concerned about graduating and putting on impromptu performances for the homeless.